Freshman RB Royce Freeman scored four touchdowns Saturday as the Ducks wasted little time pasting the Huskies for the 11th time in a row. Oregon (6-1, 3-1) made another emphatic case that Huskies vs. 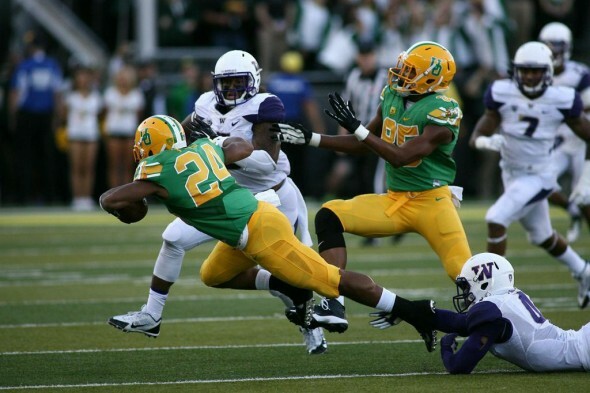 Ducks is no longer a rivalry by bludgeoning Washington (5-2, 1-2) 45-20 Saturday night at Autzen Stadium. In administering their annual beatdown, the No. 9-ranked Ducks rolled to a 28-6 halftime lead behind true freshman Royce Freeman and easily recorded their 11th consecutive victory in the series, just as oddsmakers forecast. A true freshman, Freeman romped for 169 yards on 29 carries and scored four touchdowns on runs of 37, 3, 1 and 3 yards against a Washington defense that thought it had made enough strides to somewhat contain the Ducks. But Royce and Heisman Trophy candidate QB Marcus Mariota more than quashed that notion. After a decade, Washington still hasn’t made up much ground on Oregon. After Oregon went 3-and-out on its first two series and ceded a field goal to the Huskies, the Ducks made Saturday night’s game a virtual re-run of the previous 10 editions, dominating Washington on both sides. The Ducks led 35-6 late in the third quarter before the Huskies tallied two late touchdowns. But the game was over by intermission when Oregon, with Freeman scoring three times, put it away with two second-quarter drives that underscored the disparity between the programs. The first encompassed a 17 plays and consumed 6:27, Freeman scoring on a three-yard run. The second started with the Ducks pinned at their one-yard line.They marched 99 yards in 12 plays, Freeman scoring on a one-yard run. By the time intermission arrived, the Ducks had 380 yards to Washington’s 125, had held the Huskies to 27 yards rushing, and converted 7 of 11 third downs and both of their fourth-down plays. After Washington went 3-and-out to start the second half, Oregon promptly scored again, Mariota throwing a 16-yard touchdown pass to Dwayne Stanford to make it 35-6. The rest of the game was a formality. Mariota, who exited with nine minutes left, completed 24 of 33 for 336 yards, two touchdowns and no interceptions. Freeman scored a fifth touchdown, but it was called back due to a holding call. Washington stopped the Ducks on their first drive, but didn’t make another stop until late in the third quarter. With Mariota as efficient as ever, Oregon amassed 554 yards to Washington’s 317, converted 11 of 18 third downs, three of four fourth downs, and held the Huskies to 133 rushing yards. Washington entered averaging 192. Washington’s best sequence occurred late in the third quarter when quarterback Cyler Miles orchestrated a 12-play, 79-yard drive that concluded with a three-yard touchdown pass to Deontae Cooper. The Huskies twice converted on third down and received a 33-yard run from wide receiver John Ross on a reverse. Miles completed 19 of 28 for 147 yards, but he also threw his first interception of the season just before halftime in what turned out to be key play. With the Huskies in position to bite into Oregon’s 21-6 lead, Miles was picked off — his first interception of the season. Two plays later, Mariota tossed a 23-yard TD to Byron Marshall. Miles departed the game with 10 minutes remaining to undergo a concussion protocol, and was replaced by freshman Troy Williams, who completed five of his 10 passes for 37 yards. Williams also ran five times for 28 yards and scored Washington’s final touchdown on a seven-yard run. NEXT: The Huskies return to Seattle Saturday to face Arizona State at 7:45 p.m. (ESPN). 1st Qtr. (Huskies, 3-0): Cameron Van Winkle 33 FG, 10:20. Drive: 8 plays in 30 yards in 3:17. 1st Qtr. (Ducks, 7-3): Royce Freeman 37 run (Matt Wogan kick), 8:28. Drive: 7 plays, 81 yards in 1:52. 1st Qtr. (Huskies, 7-6): Van Winkle 40 FG, 6:21. Drive: 7 plays, 52 yards in 2:07. 2nd Qtr. (Ducks 14-6): Freeman 3 run (Wogan kick), 14:54. Drive: 17 plays, 81 yards in 6:27. 2nd Qtr. (Ducks 21-6): Freeman 1 run (Wogan kick), 8:17. Drive: 12 plays, 99 yards in 3:50. 2nd Qtr. (Ducks 28-6): Byron Marshall 23 pass from Marcus Mariota (Wogan kick), 1:32. Drive: 2 plays, 23 yards in 0:20. 3rd Qtr. (Ducks 35-6): Dwayne Stanford 16 pass from Mariota (Wogan kick), 10:23. Drive: 9 plays, 58 yards in 2:48. 3rd Qtr. (Huskies 35-13): Deontae Cooper 3 pass from Cyler Miles (Van Winkle kick), 4:45. Drive: 12 plays, 79 yards in 5:38. 4th Qtr. (Ducks 42-13): Freeman 3 run (Wogan kick), 10:56. Drive: 9 plays, 47 yards in 3:00. 4th Qtr. (Huskies 42-20): Troy Williams 7 run (Van Winkle kick), 5:22. Drive: 17 plays, 75 yards in 5:34. 4th Qtr. (Ducks 45-20): Wogan 26 FG, 1:20: Drive: 6 plays, 16 yards in 4:02. I don’t think the Husky players even believe that they can ever beat Oregon. 1. We need a QB with an arm that can pick apart a defense. Cyler is NOT that QB. 2. Where was the run defense? Oregon ran the same running play again and again because we weren’t stopping them.